RF24L01+ low power wireless module, use NRF24L01 chip from Nordic, 2.4G lisence-free ISM band, highest working data speed is 2Mbps, 125channels can reach different point or jump frequency communication needs, small size 18*37 mm, high efficiency GFSK modulation, anti-interfere, specially suit for indutrial control. Integrated hardware 8/16 bytes CRC confirmation and point to mutiple points communication adress control, combine TDMA – CMDA – FDMA working principle, enable wireless communication. 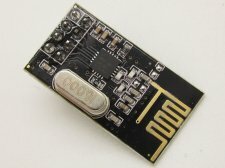 Module can set address by software, only output data when receive own device address(display interruption), can directly connect to any single chip, easy to program. Send and receive interruption signal, send 28 bytes maximally each time. Integrated special voltage regulator, use any kind of power including DC/DC power can have better communication effort. Standard DIP jack, easy for embedded system application. Two channels data receive, embedded circular antennas, communication distance is 20-30 meters in open and no interferes environment.